When I first transitioned to a plant based diet I felt like it took up so much of my time just to prepare meals! When you aren’t using convenience items, prepared foods or processed foods you are pretty much making everything from scratch. I finally found my groove by simplifying our meals. I save the fancier more time consuming recipes for family gatherings. I spend a lot less time cooking now and we enjoy the flavor of simple whole food plant based meals. A reader recently asked me to provide more information about how I use the batch cooked items through out the week. In this post I am linking to the recipes that can utilize the foods I batch cooked. This past Friday I batch cooked and then on Saturday I made two soups. We are well stocked for the week ahead. 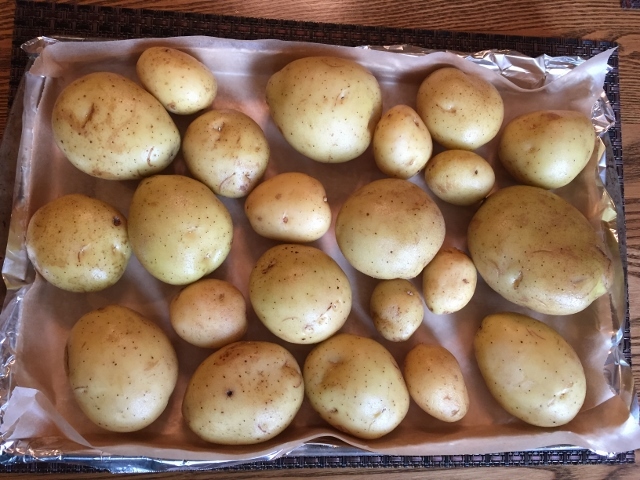 I always bake up a bag of Yukon Gold potatoes. They can be topped with a ladle of chili or soup. One of my favorite quick meals is to top a potato with black or pinto beans, frozen corn, salsa and Donna’s Cheeze Sauce. I could eat that every day! Believe it or not oil free hummus is awesome on top of a hot baked potato. Sometimes I will slice a cold baked potato into rounds and spread them with Green Chili Hummus. Cold potatoes can be cut into “fries” and placed under the broiler to brown – oven fries made easy! I learned that method from Jeff Novick. You can turn those fries into Chili Cheeze Fries by adding a ladle of chili or these amazing Chili Lentils and a dollop of Donna’s Cheeze Sauce on top. There really is so much variety in a whole food plant based diet. I found these amazing sweet potatoes at Trader Joes. They are purple looking on the outside and creamy white on the inside. Very sweet – almost like candy! Enjoy them hot out of the oven or cold from the fridge as a snack or a side dish. Yum- yum. 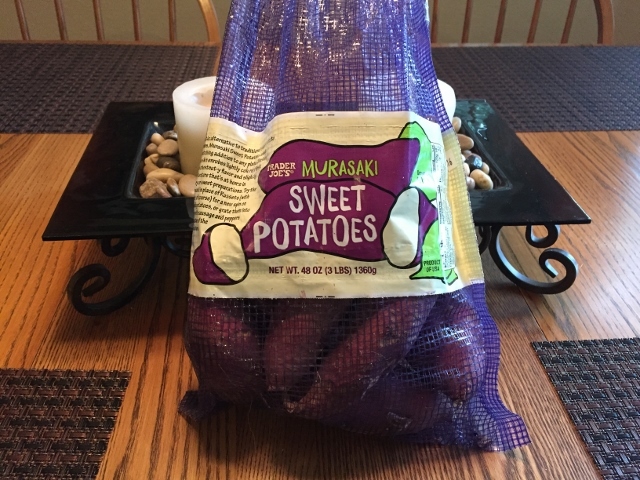 There are so many different varieties of sweet potatoes available at Whole Foods, health food stores or Asian markets. 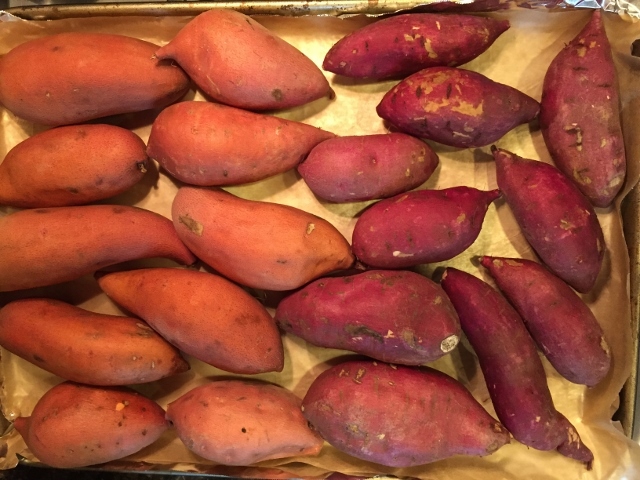 The ones on the left are regular sweet potatoes that are orange inside. On the right are Japanese sweet potatoes that are creamy white inside and very sweet. These are also delicious topped with Chef AJ’s Red Lentil Chili, Chef AJ’s Portabella Mushroom Chili or pop open a can of beans rinse and drain them and enjoy over a potato with steamed greens. Another favorite sweet potato topping is this easy peasy Chickpea Curry to make it UWL compliant just leave off the Raita. Sweet potatoes travel well for a snack on the go or right from the fridge eaten out of hand. Often times we enjoy them cold or warm and dusted with a little cinnamon as dessert! 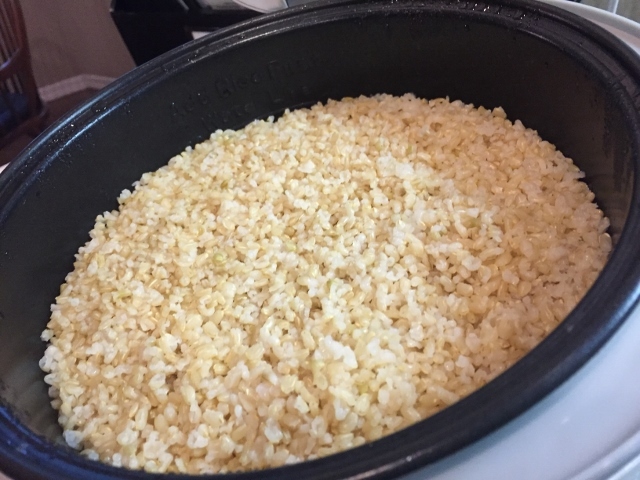 Once every two weeks we make a pot full of organic brown rice in the rice cooker. You can also make it in your pressure cooker but since we have a rice cooker that’s what we use. This is usually hubby Tom’s job. Then we put it in containers that hold 4 cups and pop those in the freezer. We can pull one container out at a time and we always have rice ready to eat. Hubby Tom is a bigger fan of rice than I am. We both do enjoy it in Nurture Bowls and that is a favorite quick meal around our house. We enjoy a variety of ethnic foods and they adapt so well to a whole food plant based diet. Indian Mango Dal is a lovely dish that is mild in flavor and slightly sweet so scrumptious over a bowl of brown rice. Curry Split Pea Soup was the first pressure cooker recipe I tried and we loved it. 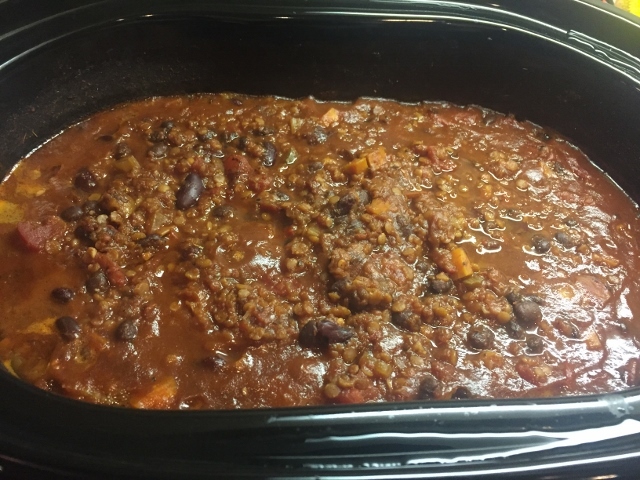 It’s a quick and easy recipe that I make often. It freeze well so I double the recipe. One of the foods I look forward to in the fall is winter squash. When oven roasted, Kabocha squash is so creamy and sweet. I love it as a snack – its quite filling with all that fiber and you can eat the skin so no peeling required! 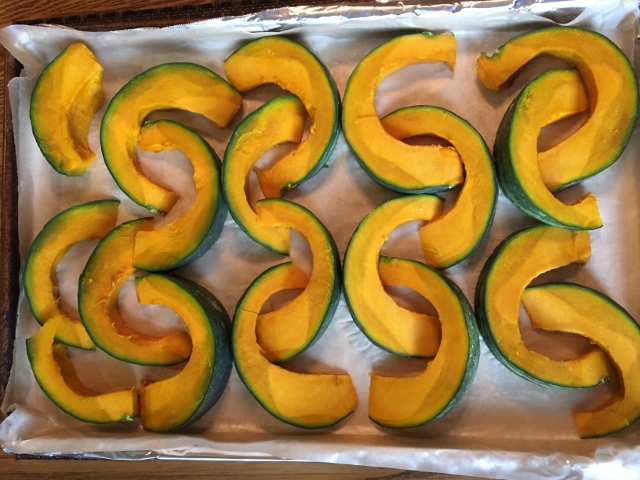 Do you want to know my secret to making it easy to cut winter squash? Of course you do – after washing it thoroughly take a sharp knife and cut some small slits into the skin – about 6 or so should be enough. Then microwave the whole squash for 3-4 minutes on high depending on the size – go for 4 minutes if its a large one. Using oven mitts remove it from the microwave and let it cool down. It will be just soft enough that you can easily cut it in half. Scoop out the seeds and fibrous material. Slice into wedges and place on a baking sheet lined with parchment paper. Place in a pre-heated 400 degree oven for about 35 minutes. You can turn it over half way if you want to but I usually don’t. When it is soft when pierced with a fork its done. Enjoy Kabocha squash as a side dish with Lentil Loaf Muffins, Veggie Burgers or dice it up and toss it on top of a mixed greens salad that has been tossed with my favorite Creamy Balsamic Dressing. Roasted squash is spectacular on top of a bowl of vegan chili. The sweetness of the squash is a nice contrast to the spicy chili. Add some to a Nourish Bowl with rice, beans and some steamed greens and a splash of balsamic vinegar. Sprinkle it with cinnamon and it becomes dessert. Have you seen already peeled and cubed butternut squash? Here I have found it at Costco and Sprouts. What an awesome convenience item. I kind of have to laugh that I now consider pre-peeled and cubed squash a convenience food! I guess that’s when you know you are a WFPB foodie! 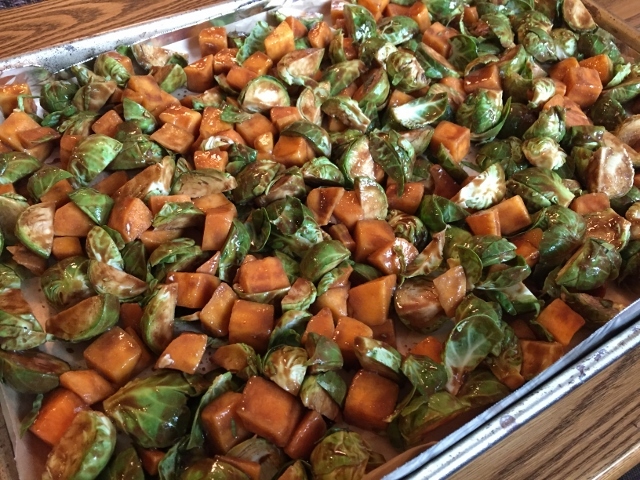 I took Chef AJ’s recipe for Brussels Sprouts and used half butternut squash and half sprouts mixed with 1/4 cup of Balsamic vinegar and 1/4 cup Dijon mustard. I let them roast for about 40 minutes in a 400 degree oven. They are amazing! Next time I think I will add a little ginger to the mixture. Put this over rice or a baked potato and you have a yummy meal! While everything else was cooking I made this Spicy Brown Rice & Bean Soup in the pressure cooker. The recipe is in the new Vegan Under Pressure cookbook by Jill Nussinow on page 187. I double the recipe and up the spices for us. It becomes quite thick after sitting. My daughter uses it as a burrito filling. We eat it up as is! If you have a pressure cooker I highly recommend this cookbook. We will eat some of this and the rest will go in the freezer for future meals. At the end of my Saturday batch cooking this is what I had ready for the fridge and the freezer. This took about 4 hours total. Of course I was multi-tasking and doing laundry at the same time. I didn’t take photos of the garnishes I prepped which were fresh cilantro, sliced green onions and some diced red onion. These can be used on top of the soups, potatoes, nourish bowls and whatever else we decide to eat in the coming week. I like containers that are clear so I can see what is in them. I have found that the pre-baked potatoes do best when left in an open container in the fridge. 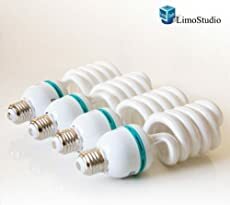 If you stand them on end they take up less room in the container and they don’t get smashed this way either. I will label the containers for the fridge with the contents and the date on them. Saturday afternoon I made two soups as we had family coming over for dinner. This is a vegetable soup – I don’t have a recipe as I just wing it and use whatever vegetables I have on hand. 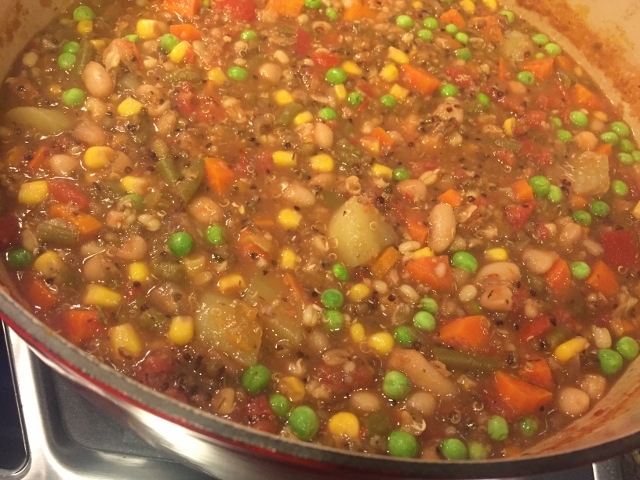 It usually starts with sauteing onions, carrots, celery and garlic, adding vegetable broth, no salt added fire roasted canned tomatoes, canned white beans – rinsed and drained, 1/3 cup quinoa and frozen corn & green beans. Since I had baked all of my potatoes I peeled three of them and diced them to add to my soup. Lots of Italian seasoning and after it simmered for an hour or so I added frozen peas. It was a huge batch so I have some to freeze. This is another family favorite recipe that lends itself to casual entertaining. 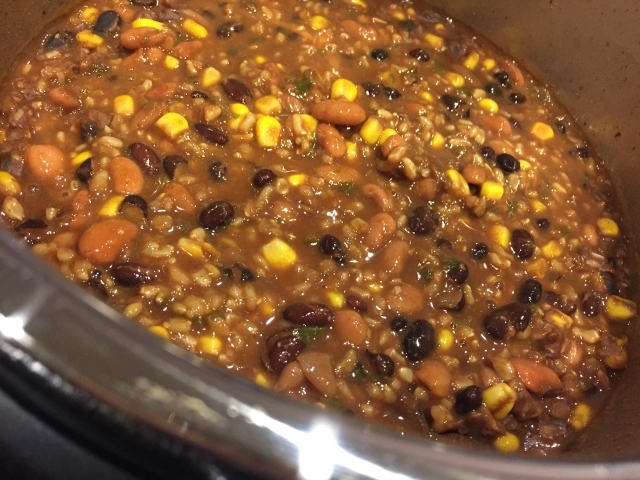 Smoky Bean Chili is a recipe from Dreena Burtons last cookbook Plant Powered Families. I double the recipe and make it in the slow cooker. It is flavorful without being too spicy so even children can enjoy this one. You can see the recipe here. I served this over the brown rice I had cooked on Friday – it reheats nicely in the microwave. For toppings I had fresh cilantro, sliced green onions and some guacamole. We also had a huge green salad with tons of veggies and a simple dressing that my daughter came up with using threee tablespoons fresh lime juice, two tablespoons Dijon mustard and one tablespoon splash of maple syrup. To make it UWL (Chef AJ’s Ultimate Weight Loss Plan) compliant I make it in the blendtec blender using a date instead of the maple syrup. Then we added fresh cilantro to the salad to mimic the flavors of the chili. It was a filling, flavorful comfort meal. There are plenty of leftovers from Saturdays soups to put some in the freezer and still have a few servings to eat this week. As you can see I really don’t need to “cook” this week. 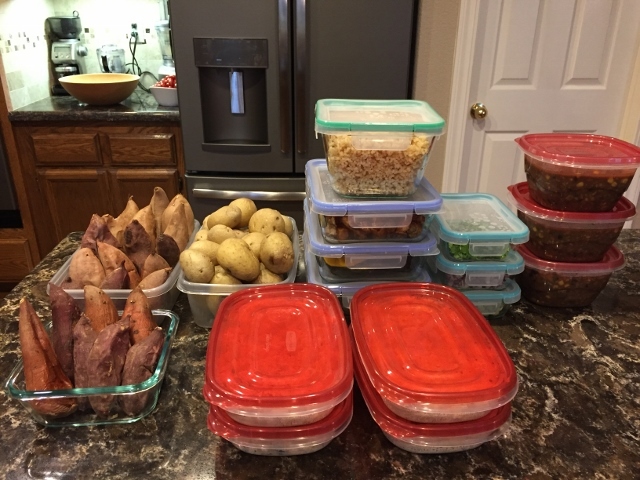 We can pull together many different meals from what is already prepped! The only thing I need to make now is another batch of my Creamy Balsamic Dressing. It has become quite popular with the WFPB – whole food plant based foodies! I buy the already tripled washed spinach, baby greens, shredded carrots, shredded red cabbage and other veggies that already washed. This makes salad prep so much quicker and if it’s quick I am more likely to eat a salad.